Recently I was at a developer camp. In attendance was a developer evangelist from Sensis who was encouraging devs to create an app for their search API http://developers.sensis.com.au/about. There was a cash prize for whoever wrote the best app by the end of the hackathon. Long story short, I came in 1st place . Sensis are a directory services company (White Pages, Yellow Pages, Business directories, etc.). 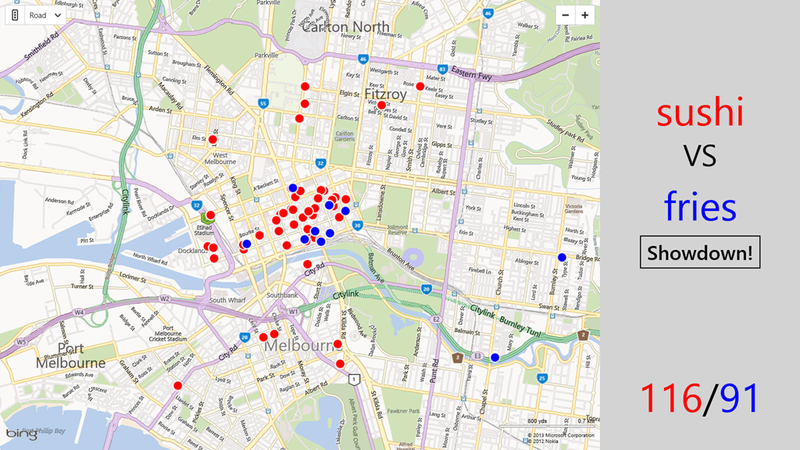 Their search API allows you to search for local businesses based on key words and locations. It was a REST based API and they provided some legacy .Net 4.5 sample code to interact with the service. 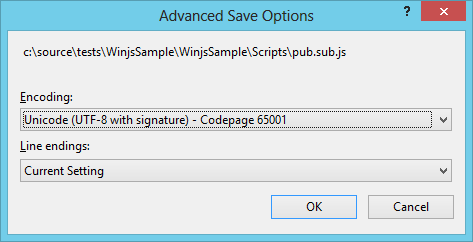 However this didn’t work with the new asynchronous apis in WinRT. So I spent an hour trying to very roughly convert it over to a WinRT compatible sample which I then shared with the entire group in attendance, to help everyone else get a head start on entering this competition https://gist.github.com/DavidBurela/5069136. The interaction code could have been my “secret sauce”, but that is no fun. Everyone at the event was there to have fun hacking away at WinRT and WinPhone apps. I wanted to see what everyone else could come up with once they had the API access code out of the way. After spending a few hours helping everyone else in attendance, I realised I only had 2 hours left to build something. 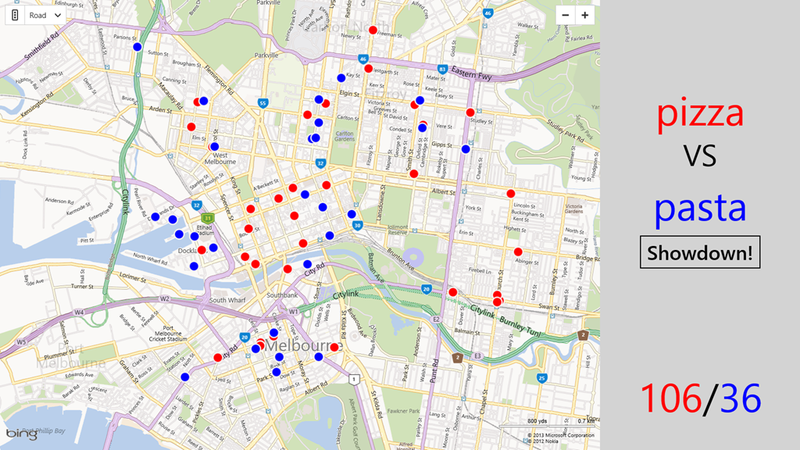 I’d done a bunch of work with the Bing Maps control recently, so it made sense to start there. A generic “search for a term and display it” app seemed boring, and is the same functionality as their own website. After a bunch of brain storming I realised I could increase it to two search terms and compare the two. This idea expanded into a competitive comparison for the ultimate argument decider. You always have random arguments when in a bar “Chinese food is more popular”, “No way pizza is”. This month saw the first Melbourne AppFest, it all went without a hitch. The facilities were perfect and the catering was the usual good Cliftons standard. We had a lot of mentor support there on the day (Nick Hodge, Frank Arrigo, David Glover, Shane Morris, and a few members from the community). There were a good number of developers there. Many of them had general development questions about Windows Phone & Windows 8, as well as a few people there interested in Windows Azure. There was a competition on the day for the best app of the day. This was won by Lars Klint for his “Picture of the day” application. It allows you to connect to a feed (such as the National Geographic) and it will change your Window Phone’s lock screen each day. 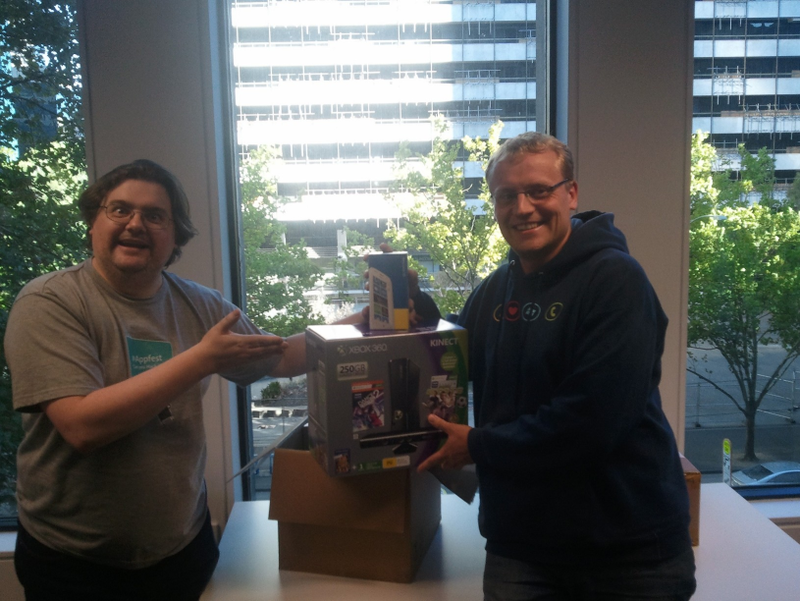 Lars won a Xbox & Kinect package! Microsoft is running Windows Azure boot camps around Australia. These are one day events that will help get you on the fast track to developing with the cloud.